I receive many requests from people for advice on how to raise sponsorship to support the cost of their expeditions or adventures (In fact I get so many requests I wrote this article giving 10 practical tips on how to do it yourself). I also frequently hear from a number of people who cannot embark on their expeditions due to a lack of sponsorship. I have raised hundreds of thousands of dollars for my expeditions throughout the years and I would like to share some good and bad news with you. The BAD NEWS is that if you are using the excuse that you cannot go on your expedition due to lack of sponsorship – you are telling a lie. If you really want to go on an expedition, you will find a way to do it. You will find a way to overcome every single hurdle put in front of you. Raising necessary funds is just ONE of those hurdles. The beautiful thing about taking on massive challenges is that it forces you out of your comfort zone and shows just how much you really want it. So how do you raise that money then? Well, the GOOD NEWS is that there are many ‘other’ legitimate and legal ways to raise dollars without going down the sponsorship route. Here I will share with you 5 tips how you can raise money for your expedition WITHOUT getting sponsorship. Each of these tips I have used successfully myself in the past so I know they work! Me giving an ‘Axe on Everest’ keynote, a story I have given at least 100 times now and raised a great deal of $ for future expeditions. Learning to tell a really good story about your adventure and especially the lessons you learned through it, which can translate to a corporate context is one sure-fire way of making money. Good keynote speaker can pull in anywhere from $500 to $10,000/talk, depending on their level of experience SPEAKING, their profile (how famous are they? ), and how much VALUE they can persuade the client they can give to their audience. I have been professionally speaking for 6 years now, and it is the number one source of raising funds to support my expeditions (my next expedition ROWING from HOME to HOME has a budget of $250,000). The problem here is that professional speaking is a profession, it is a skill that takes years to develop, and not everyone can master it, however if you are prepared to put in the effort, the rewards are there. The venue – I found a new, upcoming sports bar in the city which was looking to raise its profile and wanted to introduce itself onto the scene as the premier bar to go to in town for sports people. I visited them and told them in return for them supplying me their venue for the evening, I would bring along at least 150 new customers, all sports people themselves, definite repeat customer potential and the event would be great exposure for their new bar. They agreed to this as a fair value exchange in return for offering the venue for free. The entertainment – Rugby players when not playing rugby like to do two things, drink beer and watch rugby. I chose a night when an international rugby match was being played live on television. It was free to watch and as far as rugby players go, the best thing they could think of watching that particular evening so that solved the entertainment problem. Food and drinks – Rugby players love beer. I asked the bar to introduce me to beer sponsors, who were looking to further penetrate the sports scene in Singapore. In return for their beer, I promised them exclusivity as the official beer suppliers and splashed their logo all over the marketing info for the event (see attached). People – I leveraged off my network of friends and friends of friends to spread the word. As it was an evening of rugby and beer and very good value at S$100/ticket (as many rugby players would drink 2 – 3 times that per night in Singapore), it was really not very difficult to sell tickets. I ended with a cool S$15,000 in cash from the evening, not to mention some great exposure for my expedition! NB: It took me two attempts to get this right, the first event I ran, I paid too much for the venue and the food and drinks, did not charge enough for ticket prices and in short, was a great deal of work for what ended up to be only a few hundred dollars profit. I held two auctions where I managed to get a number of very attractive prizes to auction off and raised a total of $25,000. Examples of the prizes were vacations in luxury villas on tropical islands, tickets to sporting events , cruises on yachts, rock-climbing lessons and more. In return for the gifts, I offered the donors exposure and marketing during the auction and the build-up to the auction. The trick here is to find the most valuable prizes you can, that people will be prepared to pay as much money as possible for as they may still be getting it cheaper in the auction than what the normal list price is. To obtain these prizes, I looked for donors who were looking for more exposure for their products, who would be in a position to donate a product or service which may not necessarily COST them a great deal but has high value to the ordinary consumer. You will also need an auctioneer, a venue and people to attend the auction. For the venue, please refer to ideas from lesson 2 above. For the auctioneer, if you can’t find a friend or a friend of a friend, then do what I did and do it yourself (a terrifying experience I must admit but if you want it badly enough, you will do it). One way I found to attracting people to the auction was offering a free 45 minute inspiring keynote presentation by myself first on the evening, followed immediately by the auction. When I attended the Outward Bound School in New Zealand many years ago, I was first introduced to the world of grants and scholarships for outdoor activities. These come in many forms and can be from lotteries commissions who are forced by the governing bodies in certain countries to donate proceeds back to the community, to private companies who offer their own grants. Generally you will need to make a written submission to a panel of judges and then wait some time to hear the decision. The important thing here is to do your homework as some of the scholarships run on one or two yearly cycles, so you may need to apply one to two years before your expedition departs and ensure you do not miss the cut-off. Rather than pasting a list of links here which may soon be outdated, please use GOOGLE to find grants and scholarships which are relevant to your expedition/adventure. This is often met by silence, but those individuals who reply that they would do anything it took to get the money together are the genuine articles. These are the people I know are completely committed to the expedition. On the other hand, there are some who treat sponsorship as a paid holiday and who have the belief that if they do not get sponsorship, they will not proceed. They have no intention of putting ‘skin in the game’, and are not prepared to commit any of their own money. If your expedition means enough to you, taking a loan/mortgage is a potential option and I know some people who have successfully done this and paid it back over the next few years. It does not necessarily have to be as extreme as mortgaging your property, however even continuing working in your day job for an extra few months may be the best option all round. I have only ever embarked on one expedition that was 100% fully sponsored, the rest I have committed a significant portion of my own cash and time. I hope this article helps you.Good luck on your journey! I have been working on ROWING HOME for 1.5 years now, and I could honestly say I cannot remember a single day that has gone by during this period when I have not done something towards the expedition. Be it researching weather, equipment, boats, routes, previous similar attempts, approaching, contacting, meeting potential sponsors, training, learning technical skills, budgeting, team selection, discussing with documentary producers and keynote speaking during the evening to raise funds. Momentum has both energy and direction. By losing the momentum in a project, you risk making wrong turns as well as making forward progress. Similar to training in the gym, it’s much easier to do a little bit every day rather than attempt to do a massive amount every now and again. It takes teamwork to make a dream work. When working in teams, we can all share the same vision or end goal but have different ways of achieving this. The methodology of achieving the end goal comes down a great deal to the values of the individuals and the team as a whole. Working with teams who do not share similar values is a bit like trying to drive a car but having multiple people handling the steering wheel – all with different ideas on which direction to head to reach ultimately the same goal. In Rowing Home, I have had to make difficult decisions on team selection, and have found that whilst painful to go through, there is an almost instantaneous surge of momentum and positivity when new team members with more aligned values come on board. 3. Give before you expect to receive. Raising money for expeditions can be difficult, soul destroying at times, time consuming and on the other hand very rewarding and exciting when you are successful. As well as money, there are many forms of assistance I require and I am lucky to have help from numerous sources, some of whom wish to remain anonymous and some not. One key trait in common from the people who are helping me is the fact I have helped them in some way, at some time along the way. Or at the very least I always try and help them in the future. You are in a much better position to request support from someone whom you having assisted in some way first. I have many examples of this , for instance earlier this week I approached a chap in the UK whom I had never met but wanted a favor. I noticed he was raising money for a cause so made a donation, then sent him a message informing him I loved what he was doing, that I had donated to his cause and then finally asked him for some information. He was very hospitable and helpful in return. I also support other adventurers in many different ways, e.g. logistical support and I am continually being asked for advice on sponsorship. Often these requests I find can be somewhat rude and selfish in their approach (one lady contacted me and ordered me to introduce her to Richard Branson who she was sure would definitely sponsor her quest to climb the seven summits, unfortunately she failed on her first attempt at the first summit and gave up the project). My motivation to assist people with these requests is greatly diminished. 4. Put ‘first things first’. There are hundreds of tasks to do to prepare for ROWING HOME. But certain ones are more important than others, the ‘mission critical’ requirements which must be met within certain time frames or the expedition would literally die. One of these key tasks for example has been raising S$120,000 to get my boat finished for the expedition. I continually remind myself that without money this expedition will be nothing, and at this stage this is the most important task for my time and energy. The marketing, planning, training, preparation etc are also important however I only have so much time in one day and first things come first! My love of family also pushes me to train and prepare harder in an effort to manage the risk as responsibly as possible. Adventure means nothing without these people to return home too. Unless you are a high-profile personality like Ed Viesters, Roger Federer, Michael Jordan or Lance Armstrong (before he got busted) , chances are you will not have sponsors lining up at your door wanting to give you money. You will have to go looking for it. I have raised thousands of sponsorship dollars to fund my mountaineering expeditions. Without the help of sponsors, I would never have been able to achieve my climbing dreams such as standing on the summit of Mt Everest. A sponsorship arrangement is like a marriage. Conducted properly, it can develop into a fulfilling relationship lasting many years. Good sponsorship relationships have mutually beneficial outcomes to both parties that allow each other to realise opportunities they could perhaps never otherwise achieve. Bad sponsorship arrangements can be a painful experience. Finding sponsorship can be challenging. But if you follow these 10 simple tips below which I have learnt from experience, you too can raise thousands of dollars to finance your own expeditions and dreams. The first thing to understand is my explanation of the difference between a ‘sponsorship’ and a ‘donation’. I consider a sponsorship to be a business arrangement between two or more parties. The amount of money/ products or services given by the sponsor, should be commensurate to the level of value that the sponsor receives in return. A ‘donation’ is a gift of money/product or a service from a donar without the requirement or expectation of anything in return. Donations normally are made based on emotional grounds (e.g. supporting friends, charitable causes etc). Why is it important to realize the difference between sponsorship and donations? Because it is much easier to get money from sponsorship than it is to get money from donations. Donations rely on people’s financial generosity. In hard times this dries up quickly. Secondly there is so much competition for donations. Every person and their dog seem to be asking for ‘donations’ to support their next running, bowling or cycling cause. While I am not trying to disrespect these people – the reality is as my friend told me last week. “I am so tired of constantly being asked to donate money, it seems every time I look on Facebook or walk down the main street I am being hounded to donate to something”. This has led to a syndrome called ‘donor burnout’. Sponsorship on the other hand is a sustainable method of raising money because it is a business transaction which gives value to both parties. Thus the amount of money you can raise is only dependent on how much value you can ‘create’ and offer to the sponsor. Many people I see looking for sponsorship are approaching it more like a request for a donation. They do not offer much or anything at all of value. Done effectively you can raise thousands if not millions of dollars of sponsorship money much faster than you could ever do from simply begging for donations. Sponsorship can be in the form of a product or service or cash. For my expeditions, cash is my main priority. This is because expeditions cost a great deal of cash. This is what I focus my main efforts on searching for. Cash is also the hardest of the three to acquire! Think carefully before approaching manufacturers for equipment or gear sponsorship’s. Unless you really need that gear for your expedition and it is a high value item for you to purchase. You only have so much time to commit to searching and setting up sponsorship deals. Compare the opportunity cost of investing time searching and setting up a sponsorship deal with a gear manufacturer in exchange for say a sleeping bag or a jacket which costs a few hundred dollars too spending the same amount of time to find a cash sponsor who will give you S$50,000. You then can buy any sleeping bag or jacket you want and have more than enough left over for other expenses! It’s better to have one sponsor for $10,000 than ten sponsors all contributing $ 1,000 each. You only have so much time to commit to sponsorship deals and providing the value to sponsors which you have promised in your sponsorship contract. It is easy to develop the attitude when you start out with nothing, that ‘every little bit counts’. Be careful of over-committing yourself. Having multiple sponsors can get very difficult to manage and can also dilute the amount of coverage or focus each sponsor receives. On my first Everest expedition I worked with a number of smaller sponsors. I found it difficult and time-consuming to balance the commitments to the sponsors and focus on the expedition. As a result one of the sponsors in particular became unhappy that I could not deliver what they had asked for. I learnt from this and made the decision for my second expedition to Everest to only work with only two sponsors. This freed up a great deal more of my time and allowed me to focus on the expedition and giving the sponsors as much value as possible. My Everest expeditions alone have cost me well over S$100,000. In addition I have raised thousands of dollars for community organizations mainly from professional sponsorship. One of the key points that many people fail to appreciate is the need to realize that sponsorship is a form of business. When in business it’s very important to behave like a professional business person. Dress appropriately for meetings with potential sponsors and turn up on time! (I once had a meeting planned with the president of a very busy sports club. I was very confident of securing sponsorship through the club but I got stuck in traffic and turned up 30 minutes late for the meeting by which time he had left. The person who had helped me set-up the meeting was embarrassed and the president refused to meet me again. I did eventually secure some sponsorship however it took a further 6 weeks and many apologies). Create an online presence for your expedition through a website or blog. Remember to make your site appear in a way that a sponsor would be proud or happy to have their name associated with. Create professional looking and worded sponsorship proposals to email and pass to potential sponsors. Give options for sponsorship ‘packages’. Make it as simple as possible for the sponsor to understand what you are offering to them and what you are asking for in return. You will also need to be able to prepare invoices and receipts to receive sponsorship payments. (You can download and customize sample formats of contract’s invoice and receipt templates off the internet). Remember to talk at the level of your sponsor using language appropriate to them and their business. For example, it is not appropriate for me to sit in a meeting with the managing director of a company who has no interest or background in climbing and explain about my weekend ‘pumping out on the crux pitch of a 5.9 off- width flared crack when I my last piece of pro popped’. Instead I should be focusing on discussing the ways that being associated with my expedition would offer value to their organization, using language appropriate to the corporate environment. One of my sponsors informed me after an expedition, that the money they invested in my sponsorship was the best marketing investment they had ever made. This has resulted in a fruitful ongoing relationship. If you can give your sponsors this kind of value, it increases your chances greatly of working with them in the future. Consequently if you do a poor job and the sponsor is not satisfied with the value they got from working with you – then you can kiss goodbye to their support again! Remember it’s a business relationship. If you get poor or bad service from a company, would you go back again? Search for a company or organizations which share or can relate to or wants to be associated with similar vision’s to your expedition. This takes time and effort to research. For example a mountaineering expedition to a virgin peak would invoke vision’s of moving into new territory, boldness, exploration, calculated risk and pushing our boundaries. Companies who are at the cutting edge of their fields, developing new technologies or new markets (maybe in the country your expedition will be headed?) would relate to this vision. It also helps enormously if you can share a personal synergy with the sponsors. I had a meeting with the Managing Director of a large multinational logistics firm. He was very interested in my expedition and we talked for a long time about what value they could get from sponsoring me. Whatever idea’s I proposed he did not seem to appreciate or understand, and whatever idea’s he proposed to me were not practical. In the end we could not come to a deal and the main reason was there was not enough synergy between us. Hold on? If a company is going to sponsor me, surely it is all about me? Wrong!!! An organisation is not generally going to sponsor you because you are ‘you’ or even what you are going to do on your expedition(unless you are ridiculously famous, good-looking and have a squeaky clean image). The reason they will sponsor you is ‘what’s in it for them?’. What value they are going to get out of it? That’s what you need to focus on when you communicate with them. Do your homework before approaching the sponsor to determine what they will find valuable from being associated with your expedition. Companies will differ with what they want. Some sponsors want to raise their public profile or gain more media exposure. A small company in a niche market may not be interested in mass media at all but instead want to communicate with their key customers on a different topic than normal day-to-day business activities. Equipment manufacturers may want their gear tested and have it seen and photographed for marketing purposes. SWORKE sponsored me eye wear in return for images from Mt Everest wearing their sunglasses. That’s me on the right hand side. Don’t make the mistake of arranging a meeting with a potential sponsor and then wasting the majority of your time talking about how you want to be the first person to climb Everest oxygen-less, and naked wearing only a pair of roller skates. While the goal of your expedition is important, it should be summed up in a few sentences. Then you MUST focus your time and effort on the value that the sponsor will be getting from your proposal. This is the ‘music’ that the sponsor wants to hear. Beware of the ‘flag on the summit syndrome’. A common conception of a climbing sponsorship revolves around getting a photo with the sponsors flag on a particular summit. This is very risky. It is also very unimaginative. What if you don’t make the summit? What if you do make the summit but your camera is frozen up and will not work? My point is, don’t hinge the success or failure of your entire sponsorship arrangement on one risky event. If you are creative, you can develop a whole publicity campaign for your sponsors which has a ‘before’, a ‘during’ and an ‘after’ expedition phase. You can leverage heavily on pre-expedition publicity and coverage so that the sponsor gets a great deal of value before the expedition even starts! This takes a lot of pressure off you during the expedition. 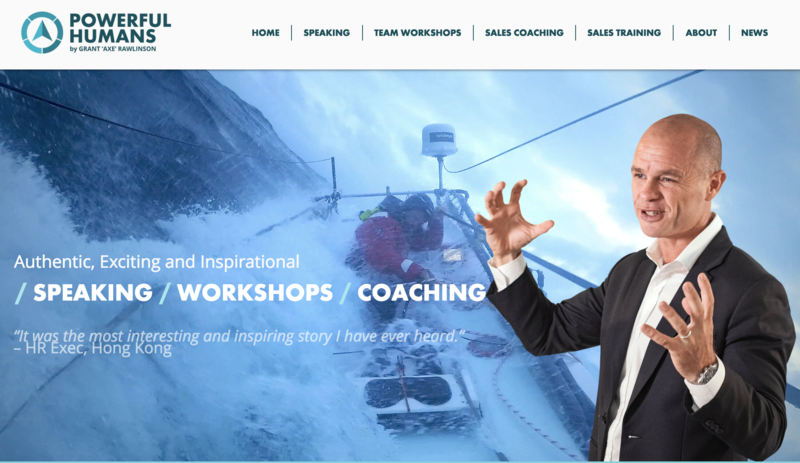 During my 2012 Everest, I had a deal with a sponsor which involved pre-expedition talks, website exposure on my expedition blogs for the expedition phase and post expedition lectures and talks to their customers. As well as what was listed in our sponsorship contract, I managed to get media exposure over and above our agreement like this 6 minute Television clip featuring me thanking the sponsor from the summit which aired on prime time TV in New Zealand. You should if possible aim to ‘over deliver’ to your sponsors. That way you are setting your future up nicely to continue the relationship. Your key focus when contacting potential sponsors is to arrange a meeting with the decision maker. A person who has the authority to say ‘yes’ or ‘no’ to your proposal. The most effective way I have found is by using my network of friends and colleagues to make personal introductions. If you are targeting a specific organization but have no personal contact with the decision maker, don’t waste time starting at the bottom of hierarchy. The lower level people will pass you off very quickly or will promise to ‘pass your request on’ and that is the last you will ever hear of it. Try and find someone in your network who can make a personal introduction. I once spent months ‘cold contacting’ companies. Most of the time I never even received a response. To their credit the ‘Body Shop’ in Singapore were polite enough to send me a rejection email. This was the final nail in the coffin for me and I knew I had to change tactics. I started using my network of friends and acquaintances to make introductions to key decision makers in organisations and eventually got an introduction to the director of a company who become a key sponsor. Once you do have that meeting arranged with the decision maker, you need to prepare your ‘sales pitch’. My rule of thumb is that you should be able to sum up and deliver an inspiring sales pitch within two minutes (shorter if possible) that will make or break the deal. You must prepare and practice this. Remember that managers are generally very busy people. You will have their complete attention for a very short period before their eyes will start to glaze over and they will start looking at their blackberry phones and wonder what they will be having for lunch. If you are droning on for 45 minutes and they still aren’t getting it, you have probably lost them. I can generally tell within this first few minutes if I will be successful or not. This does not mean that your meeting should be over within 2 minutes, it may end up taking one hour to discuss the finer details, however you should aim to ‘snag them’ as early as possible. In 2011 I managed to secure a meeting with a senior manager of a large company. I was excited about this as I knew he was the decision maker. I prepared for the meeting, turned up early, bought my marketing material. However 30 minutes later I was still there trying to explain the whole concept. I could literally feel the enthusiasm draining from him the longer I talked and he was getting more and more impatient. I left after 45 minutes and knew that it was no deal which they confirmed by email the next day. Having someone who can mentor you is very useful. Someone you can discuss your idea’s, advise you, pick you up when are feeling down etc. Don’t expect a mentor to lead you directly to a sponsor, but they should be able to encourage and teach you. Choose your mentor carefully and beware of ‘false prophets’. The best people to have as mentors are people who have been there and done that (i,e, raised significant amounts of money themselves through sponsorship). If you can’t find these people then I suggest you find someone who is a professional and successful sales person. The ‘business’ of raising sponsorship is mainly a sales activity. You are selling your expedition and the value it can bring to the sponsor. Professional sales people should know how to approach clients and the art of selling and will be able to share these techniques. Finding sponsors takes time. You will need to be patient. You will need to be thick-skinned to handle the numerous rejections. Don’t be surprised if you approach 20 – 50+ companies before you strike a deal. Over time it gets easier as you become more experienced. You will need to be disciplined and hard-working. I set myself rules when looking for sponsors, that every day I would contact at least one new company and try to make an appointment with the decision maker. In 2009 I was sourcing for sponsorship for an expedition to Kazakhstan We had a ‘pre-expedition’ press release which made it into the national newspaper. The week before we left, When a potential sponsor saw this it was the final motivation they needed to commit S$20,000 to the expedition two days before we left! I kept trying until the end and was patient! I also share my climbing and sponsorship raising experiences through lectures and presentations. Do feel free to contact me to discuss more. Climbing Everest by any means is an expensive operation. By the time you add up all the expenses such as: climbing insurance, air travel, training expenses, overland travel, personal climbing gear, communications equipment, climbing permits, expedition logistical fee’s, high altitude food, etc… the bottom line starts to look very daunting. To put it into perspective – my 2011 attempt and my upcoming 2012 attempt on Everest have cost me well over S$100,000 dollars. And I am doing things rather modestly! I borrow gear whenever I can and I do not climb with the large expedition organizers who have enormous support, lavish base-camps and price tags almost double of what I am paying. To top this off I am away on the mountain for months at a time earning no salary, but the financial commitments at home remain. Mortgage repayments, car loans, rates, insurance, maintenance fee’s all keep rolling in even when the salary does not. Climbing is definitely not a lifestyle to follow if you want to become rich and famous! As a climber wanting to attempt a mountain like Everest, I need the help of sponsors. I am proud to announce that I will be working again this year with the valuation specialists ‘John Foord’. 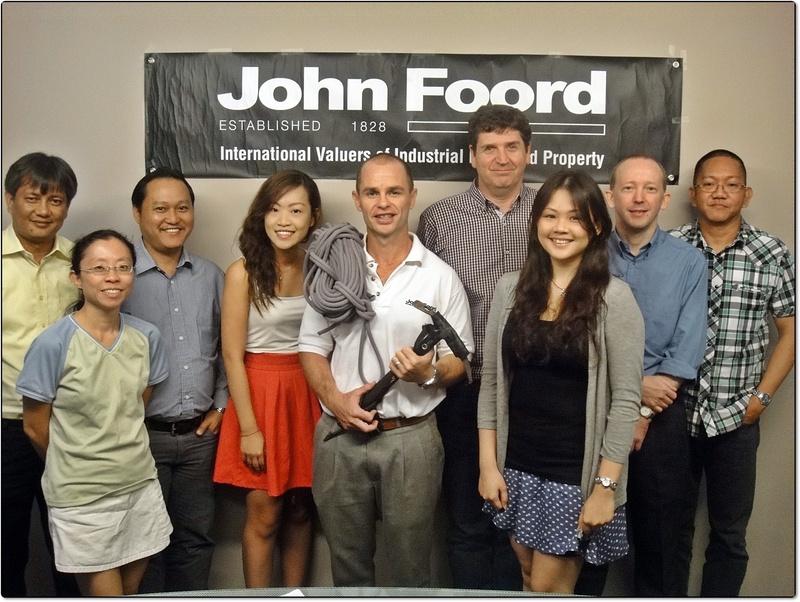 John Foord is a multi-national specialist industrial valuation and appraisal company. 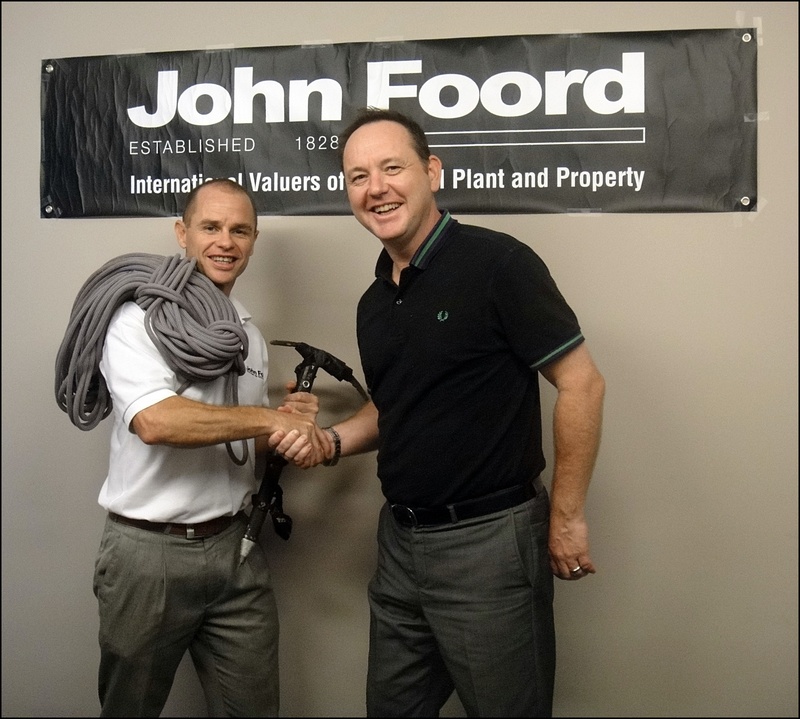 John Foord will be the title sponsor of the expedition which is now officially named: ‘John Foord’s Axe On Everest 2012’. I feel a very strong synergy with John Foord, from the first time we first started working together last year. Managing director Mr Graham Copland and Valuation director Mr Gregory Dickerson (who also happens to be a fellow kiwi), share the same down to earth value’s that I do. Perseverance, determination and a goal-oriented mindset. Over the course of the next few months, in conjunction with John Foord, we will be holding pre-expedition and post-expedition presentation evenings on my Everest climb’s. 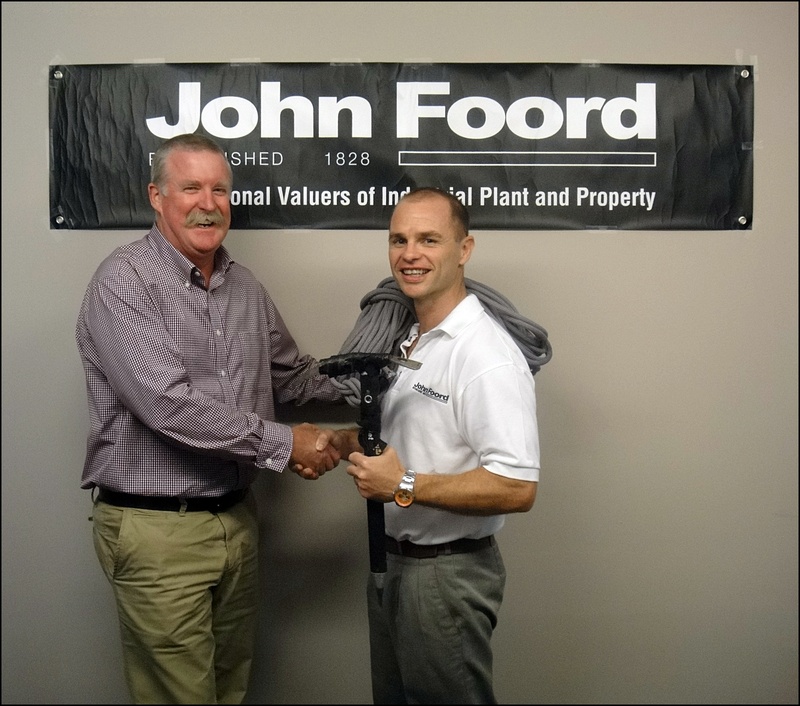 To learn more about John Foord, click here. 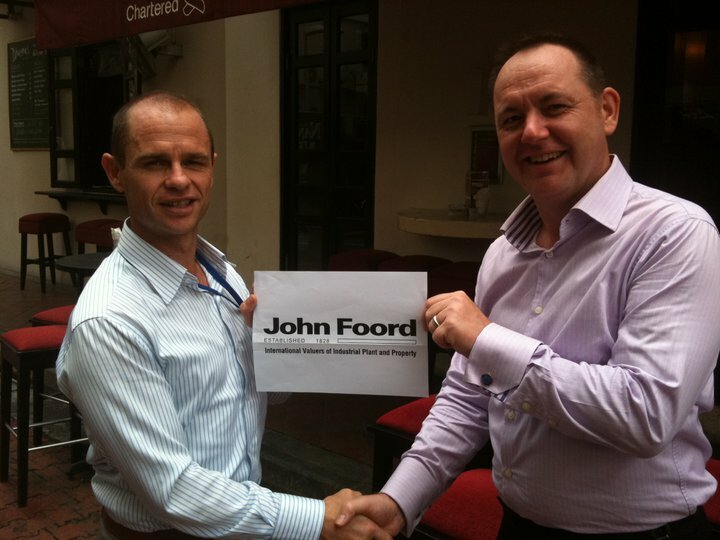 John Foord signs on as main expedition sponsor! 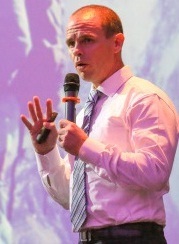 In a last-minute deal, Singapore based Industrial Valuation specialists John Foord signed on as the main expedition sponsor for Everest 2011 – Climbing for Humaneity. The deal includes banners and logos on my summit climbing suit, regular updates and photo’s from the mountain and speaking engagements post expedition. Well it’s a crazy rush with two days to go to finish up work, pack the bags and catch the plane for Nepal on Wednesday morning. More updates to come soon!